Optical grade transmittance ensures a clear image and highlights the sense of three-dimensionality. high-grade tempered glass and is clearer than other privacy screen savers. The premium tempered glass is coated with shatter-proof layer. It provides a firm protection which can disperse the impact from accidentally drop and scratches. In extremely bent test, the glass won't crack into sharp pieces which may cause injuries, instead, it breaks into spider webbing. 18 strict tests are applied to the Protective film, including ball-drop test,120 degree bent test. Coating prevents fingerprints or stains and is easy to clean. 1.Clean by using wet/dried cloth. 2. Make one side fixed by using tape ,then align. 3.Remove the bubbles by gently pushing by thumb from bottom to top. 4.Gently pushing both sides from bottom to top. 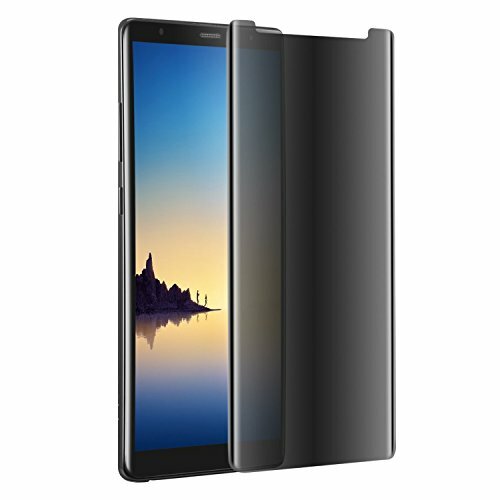 【Anti-Spy Privacy Protection】Specifically designed for Samsung Galaxy Note 8 (2017) ,360 degree privacy tempered glass protect your privacy,Screen is only visible to persons directly in front of screen. 【High Definition】Made with high quality premium tempered glass, Maxsoco privacy glass is much clearer than other privacy screen protector. 【Case Friendly】We specially designed the 99% Screen Coverage Protection 3D curved edge to edge film, which is to ensure our film is absolutely compatible with most phone cases. 【Original Touch Sensitivity】The ultra thin screen protector promises full compatibility with touchscreen sensitivity and preserves your phone's original high-response touch feeling without any interference. 【Service and Warranty】We do 100% QC inspection before shipping and no hassle lifetime warranty for ALL screen protectors. Should you have any question, feel free to let us know. We will try out best to satisfy you. If you have any questions about this product by Maxsoco, contact us by completing and submitting the form below. If you are looking for a specif part number, please include it with your message.